Comments allow visitors to your site to post feedback and replies to posts and pages. You have the ability to screen comments before they appear on your site through a moderation queue, and we strongly encourage you to set up your site so that comments require moderation. This will disable comments on all future pages and posts by default; however, comments can be enabled on a per-page/post basis. Also, please note that disabling comments in this way will only effect posts/pages going forward. The comment settings for existing pages and posts will stay as they are. This will produce an additional "Discussion" box (likely near the bottom of your post/page Edit interface). To enable comments, check the "Allow comments" box. To disable comment, uncheck this box. You can also enable/disable comments in bulk on the posts and pages listing sections. This can be done either as a "Quick Edit" for individual posts or pages, or as a bulk edit action. 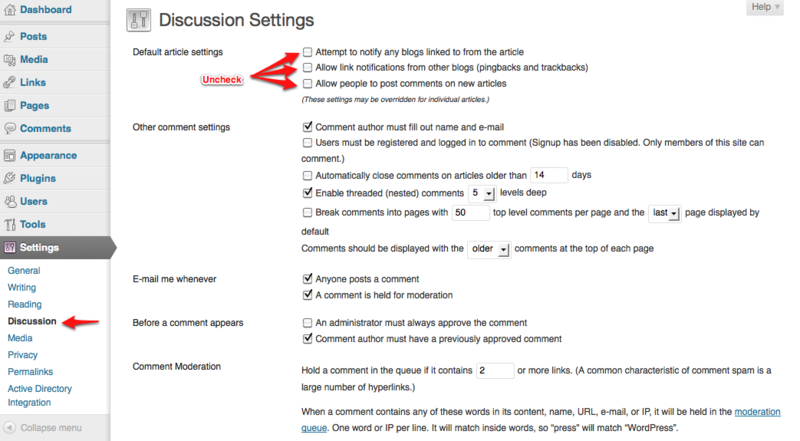 Users on the blog who have Editor or Administrator rights will have the ability to manage comments. If you have "Email me whenever..." notifications turned on for comments under Settings > Discussion, the email address specified in the Settings > General section will be notified that a comment is waiting for approval. If you require comment moderation on your site (and we strongly encourage that you do), comments will be held in this moderation queue and will not be published until you approve them. These actions can also be performed in bulk on this screen. You may find that your site receives the occasional "comment spam" -- often characterized by gibberish, ads for pharmaceutical products, or requests to visit non-related websites. 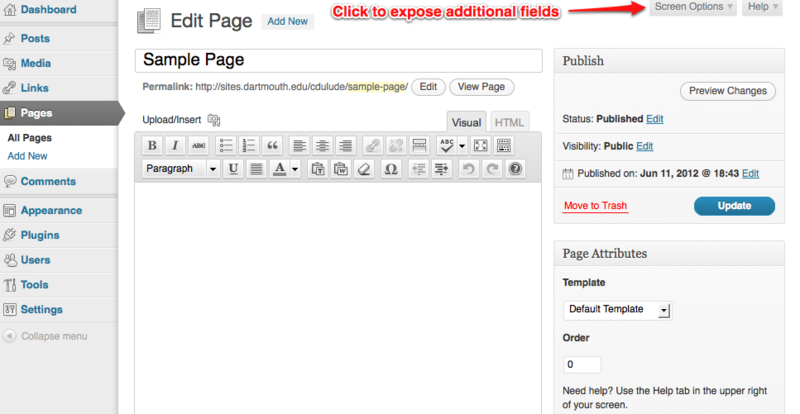 The Akismet comment spam protection is enabled for all Dartmouth WordPress sites. However, if you find you are receiving a large amount of comment spam, you may need to strengthen your comment settings. This can be done under Settings > Discussion, under "Comment Moderation" and "Comment Blacklist." Comments that fit the "Comment Moderation" criteria will be held for moderation in addition to any other moderation settings that had been specified. Comments that fit the "Comment Blacklist" criteria will bypass moderation and be automatically held as spam.